During her set in a New Year’s Day concert last night at the MGM Grand at Foxwoods, Sarah McLachlan admits to being a little fuddled from the DayQuil medicine she took for her passing cold. Or she’s still getting over her hangover from the previous night’s camaraderie of festivities in Atlantic City. Perhaps that’s why she exhibited such a loopy and forgetful presence onstage. But no matter, her songs stand out as heartfelt lilting ballads of love, heartbreak and meditation. Although not necessarily in that order. Billed as an intimate evening with friends, it was an evening that showcased her angelic singing and her collaborative support for the two female artists that performed on each side of her. The friends in question were two female singer-songwriters, Melissa McClelland, on guitar, and Butterfly Boucher, on bass. Both were featured on the side stages of McLachlan’s Lilith Fair tour last summer. You can probably count in the other male bandmates as friends, too. The concert started promptly with no opening act, which is a plus for fans who don’t want to wait around for the headliner and sit through an unknown artist. A minus for those fans conditioned to bypass the opener and arrive later. Luckily I arrived on time and was surprised to see McLachlan adhere to schedule. To give those artists she has cultivated more of a proper audience, McLachlan had them perform two songs each in the middle of the main set. Which worked to everyone’s benefit because it allowed the audience to discover what these two female singers had to offer. Myself included, most people would have easily missed such substantial, but distinctive, music-making. After McLachlan finished performing her first few hits, she turned it over to Butterfly Boucher. An Australian native who’s currently residing in Nashville, her songs had a refreshing folksiness to it, with clear rhythmic guitar melodies. Boucher previously performed as the opening act on McLachlan’s 2004 Afterglow Tour. Subsequently Melissa McClelland also made her mark by driving through a smoky blues stomper that belied her appearance in glossy red heels. With more grit, she would eventually have to trade off those heels for some sassy boots. After seeing these two artists perform, McLachlan clearly has the confidence and instinct for new talent. It worked, because it served as an unexpected highlight for fans who support new music. The evening also featured some questions by fans who wrote their inquiries on slips of paper beforehand. Like a cozy and informal living room gathering, McLachlan wanted her audience to interact and get close by revealing such taboo issues as “Does size matter?”, and “Have you made love to a girl?” The former made McLachlan giggle girlishly and prompted her to declare an indistinct and quick reply before moving on to the next question. The answer to that other question was a no, but she did kiss a girl some years back when she was in some broom closet. Not that you needed to know, however, those were some of the pressing questions fans wanted to know about her. Performing a mixture of her past hits and a handful of new songs from her current album, “Laws of Illusion”, McLachlan can be forgiven for getting over a cold and forgetting some of her lyrics. 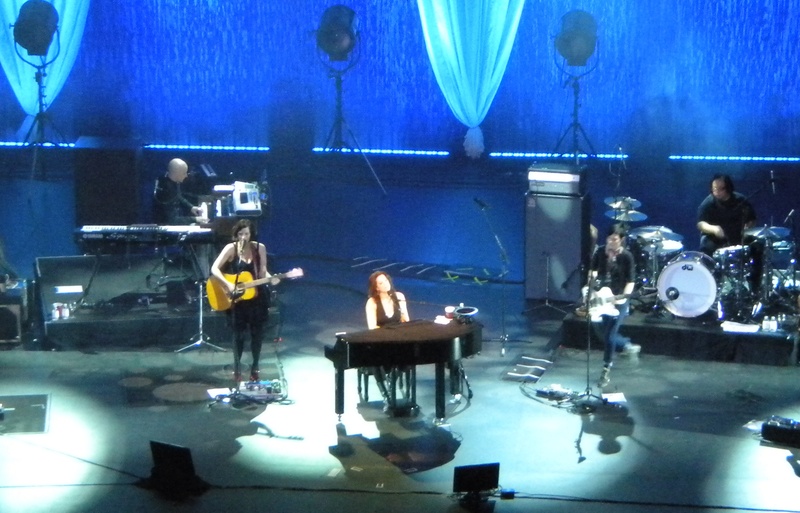 Her gorgeous piano ballads like “Angel” and “I Will Remember You” propel her voice to lush heights and effortlessness. As on CD, McLachlan sings with unadorned clarity that was not affected by the residual laryngitis she’s been suffering from. A slight audible raspiness can be detected in her plain speaking voice, but in performance, McLachlan delivers that emotional resonance that chills your heart and makes you feel the words.